Here's one more interesting town plat, before we move on. Back in the first decade of the twentieth century, the United States Reclamation Service was was hard at work building the Sun River Project, a large irrigation scheme designed to turn much of the Sun River valley into an agricultural paradise. As envisioned, the completed project would provide irrigated tracts to hundreds of small farmers, greatly increasing the valley's population and requiring the development of new communities. To meet this future need, the Reclamation Service reserved land for the development of a series of small, "model" villages with a unique layout. 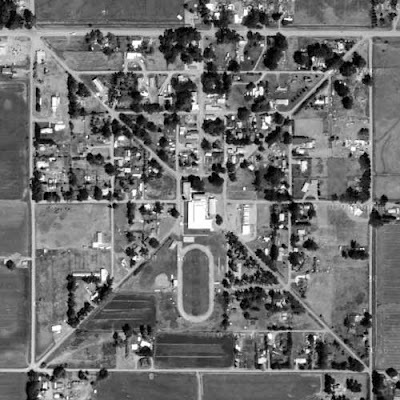 The town plats were square, with a school tract at the exact center and eight streets radiating outward from there like spokes. There was a small business district and enough residential lots that farmers could live in town rather than out on the valuable farmland. Ultimately, the Sun River Project served far fewer settlers than originally envisioned, and only two of the villages were actually established -- the present-day towns of Fort Shaw and Simms. The unusual town plats are still in evidence at both places ... particularly Simms, where most of the streets remain and the school is still at the center of the hub. Fewer streets remain at Fort Shaw, and Highway 200 runs right through the middle of the school tract. That's lovely! Most of our little towns grew like fungus, whichever way was most hospitable to build. It's incredible to see it from the air. Yep, I really liked that design, too! But you're right -- it's probably a good thing that Simms never grew too big, or all those weird intersections would be giving people fits. I suppose back then, the people who platted that little town weren't even thinking about cars.